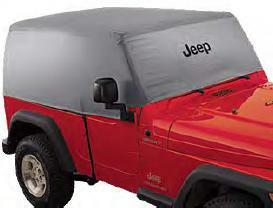 Weather-resistant high quality nylon cap in Black or Silver fits snugly over your Jeep Wrangler's hard or soft top. Silver color is a sun reflective material that reduces interior temperatures and sun fading. Great for sunny climates. Also will fit with top off to help keep interior clean and dry. Elastic loops attach around taillights and mirrors, and includes two integrated cords that attach to the Jeep to secure the cover under the door area. Folds into a small snap closure storage bag that is included. 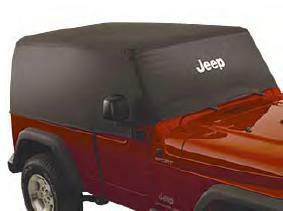 SWB or LWB "Unlimited" Black water-resistant nylon Cab Cover with Jeep logo. Also available in SWB or LWB "Unlimited" Silver heat reflective Cab Cover with Jeep logo. It is not waterproof or even water resistant. It doesn't fit a Jeep Wrangler 2016 properly. It is too snug. ProsRelatively quick to put on and off. Great when you have the top off and you are parking your Jeep and there is a chance of rain. ProsLooks good and keeps the elements out. Easy to put on and take off. ConsNot the best fit in the back, sags a little.